CHAPEL HILL, N.C. -- North Carolina made shot after shot, finally backing its Hall of Fame coach's claim that he has a sharp-shooting bunch. And when they did miss, the Tar Heels relentlessly flew to the rim to pursue the ball for another chance. It was a few days after Thanksgiving when the Tar Heels lost at No. 5 Michigan, looking overwhelmed at both ends and leaving Roy Williams to say -- among many things -- that "right now we stink." "I think we needed it, just to show ourselves how good we can be," senior guard Kenny Williams said. "We see everybody talking about Carolina's defense is horrible' and all that, so we just need to show ourselves how good we can be and the potential we could play with going deep into the season." Gonzaga: The Bulldogs sat at No. 1 in the AP Top 25 about a week ago, but they've lost two straight -- though both games were serious nonconference tests. They lost a close one last weekend against No. 3 Tennessee, then fell behind early Saturday night and never could catch up against a UNC offense that looked very comfortable on its home floor. 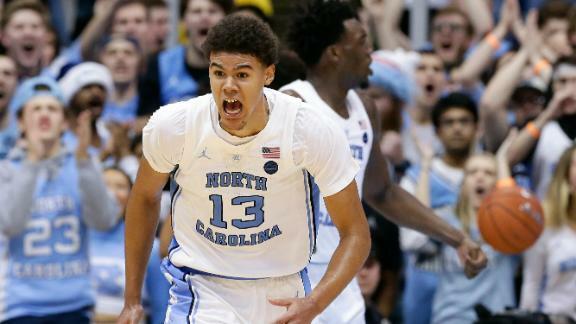 UNC: The Tar Heels offered a reminder that they have the firepower to score with just about anybody. One significant concern, though, was they committed a season-high 23 turnovers that led to 29 points for Gonzaga -- the kind of mistakes that could've proved very costly had North Carolina not been shooting so well and dominating the glass. Cameron Johnson drops 25 points as No. 12 North Carolina upsets No. 4 Gonzaga 103-90.